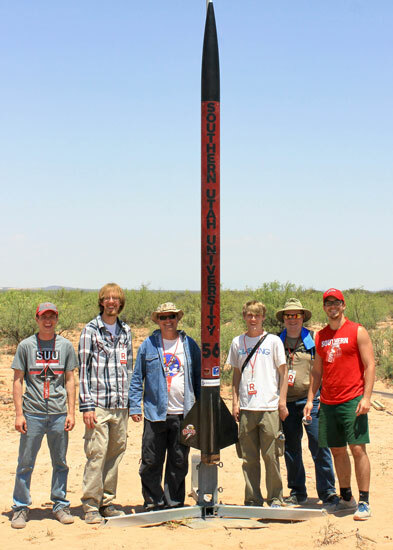 The Rocketbirds, a Southern Utah University engineering student club, earned high honors last month at the 2017 Spaceport America Cup in Sierra County, New Mexico. The SUU team placed third in the Space Dynamics Laboratory Payload Challenge, beating out 40 competitors and was third in the 10k Solid Student Researched and Developed propulsion category. Overall, the Rocketbirds placed 25 out of 82 teams competing. Considering the size of other universities in attendance, SUU’s team performed exceptionally well and ranked higher than last year’s competition. Five SUU students travelled with Dr. Scott Munro, associate professor of engineering, to a desert area just outside the town of Truth or Consequences, New Mexico. The first day of the competition consisted of a session where teams interacted with each other, judges and members of the public. The remaining days were spent at the launch site. With more than 110 teams from colleges and universities representing 11 countries, 2017 was the competition’s largest year to date. Students launched solid, liquid, and hybrid rockets to target altitudes of 10,000 and 30,000 feet. The competition helped students apply classroom concepts to real-world problems by constructing a 12.5 foot rocket. More than 20 students from across campus became involved in the design, construction and testing of the rocket throughout the 2016-17 school year. The multi-discipline project included aerodynamics, structures, propulsion (chemistry), electrical and testing operations. SUU students were split into several teams to construct their rocket, including propulsion, airframe, avionics and payload. The rocket design revolved around the payload, which was a defined size. From there, the team determined how big the rocket needed to be. The final product was 6 inches in diameter, 12.5 feet in height, 75 pounds in weight. The structure and was constructed entirely from fiberglass. Computer simulations were done to verify the rocket’s stability and performance during flight. For Tim Austin, a senior engineering major, the Payload Challenge was a highlight. To compete in the challenge, teams had to design a unique payload with some functionality. SUU’s team chose to build an electric generator and decided to have it separate from the rocket and descend on it’s own. Students worked together to create a 3D computer model of the large propellor, then used drafting software to cut each blade and install a hinge. This allowed the propellor to fold small enough to fit inside the rocket, but also to unfold once it deployed to generate the needed power. This propellor power was used to charge a siren battery, designed to help the team locate the generator as it fell. However, during the launch the team could not verify the payload performed as expected. Despite this, the judges were impressed with the team’s concept and design and awarded them third place. The Rocket Club is funded by a grant from the Utah Space Grant Consortium, department funding and funds from the Engineering Initiative. 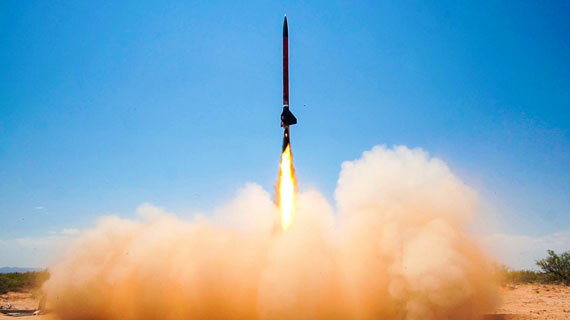 The Spaceport America Cup is designed around the Intercollegiate Rocket Engineering Competition for student rocketry teams from across the world. The IREC has held annual competitions since 2006. Previously held in Green River, Utah, the competition achieved international status in 2011 when schools from Canada and Brazil joined and has doubled in size every year since 2013. To learn more about SUU’s Engineering Program, visit https://www.suu.edu/cose/et/.